Part of me really hates bringing the conversation back to scalps again, in-between all the lovely AW make-up and new haircuts it feels a shame to start talking scalps! Plus I’ve wittered on about my scalp issues many a time before and at the risk of boring some, I’m doing so again! 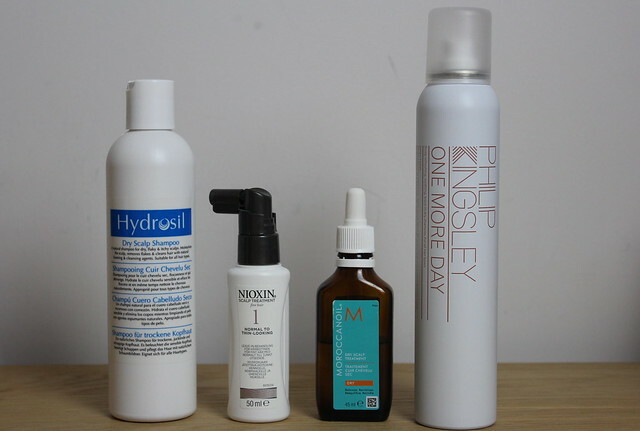 But over the recent months a few products have been rocking my world in the scalp department. I know, a big, very glamorous claim – but it’s true. So they deserve a dedicated post to their scalp-loving goodness. First up is Hydrosil Dry Scalp Shampoo* – about as unglamorous or attractive looking a product as you can get, but it is designed for function over prettiness and I’m ok with that (it can always be hidden in the bathroom rather than on show). It’s a very basic feeling shampoo, a clear liquid, with a very plain, soapy smell – if anything it feels like a really ‘cheap’ shampoo, but without all the scalp-stripping negative effects. I’ve been using this between one and three times a week to give the scalp a cleanse without leaving it stripped. I don’t use it daily, purely because there are a couple of other shampoos I’m using at the moment that fulfil my craving for nice smelling, slightly more girly shampoos. But as a regular treatment, this is going down a treat. Then on the treatment side I’m still loving my Moroccanoil Dry Scalp treatment and am now on my second bottle after re-purchasing, I apply this very close to the hairline as that’s where I tend to get the most noticable dryness and it really helps. You can read the full review HERE. I’ve also gone back to using my Nioxin Scalp Treatment* that I love because it really keeps my scalp feeling fresh and clean and leaves my fine hair feeling good too. This has a neat little pump that allows me to apply straight to the scalp easily. Another one I have reviewed before, so check out my full thoughts HERE. Lastly, I have really fallen for the Philip Kingsley ‘One More Day’ dry shampoo* a ‘scalp refreshing, soothing, leave-in dry shampoo’. It’s a really fine and refreshing dry shampoo that doesn’t leave my scalp feeling gunked up, but instead fresh and almost-clean. Clean enough to blag another day between washes at least! One of my main bug bears with dry shampoo is that it tend to feel great on first application, but then after a while the scalp feels a bit grubby with residue and even less clean than it did before. Maybe it’s just me that feels like that – but this Dry Shampoo is fine enough to avoid that feeling. But it is one that can leave that white-powder look if you use too close to darker hair (it shows on the darker underneath layers of my hair) but as long as you don’t spray too close, this is a fab one if you want an extra day but don’t want the gross-scalp-build-up thing. I don’t mind if you talk about you scalp, if anything I think its good, you trying all those products and recommending them to use when they help you. There is so much out there that sometimes you don’t know where to start and also not waist your money on products that don’t work.